St Giles' Cathedral, High St, Edinburgh EH1 1RE - View Map & Additional Info From 9am Mon-Sat, 1pm on Sunday, till 5pm each day. From November 1, 2018 to November 15, 2018. Alison Kinnaird has been invited to show her installation ‘Unknown’ in St Giles Cathedral in Edinburgh from 1st-15th November, marking Remembrance Week 2018. This artwork is the artist’s response to the present state of conflict in so many parts of the world and the fact that we never seem to learn from the experiences of the past. Glass seemed the ideal medium in which to comment on the fragility of human life in war; it is both dangerous and vulnerable, common-place yet precious, and has a purity and spiritual quality. The figures of the soldiers, each nearly half a metre tall, are ranged in regimented rows, but each one is differently engraved – a unique individual, although the first impression is that of a uniform army. They are not soldiers of any historical period – their clothing is based on modern army uniforms, but rendered in a somewhat abstract style so that they represent a universal soldier. Young men, each of them somebody’s son, brother, husband or father are sent in our name, into dreadful situations. The installation makes references to the Terracotta Army of the Chinese Emperors, who were intended to accompany him into the afterlife. The transparency of the glass emphasises the ghost-like feeling of the figures. The rows of flat figures also refer to fairground shooting galleries, as do the target designs engraved on some of the soldiers. Amongst the soldiers are a few figures of men, women and children, representing the ‘collateral damage’ – the civilians who are inevitably caught up in conflict. This piece combines various modern and ancient techniques. Wheel-engraving, an ancient technique which has remained virtually unchanged for thousands of years, uses diamond or copper wheels turning on a small lathe. Each wheel makes a different cut on the glass, and these are blended together to create 3-dimensional modelling – in effect, a low relief sculpture, impossible to achieve with any other engraving technique. 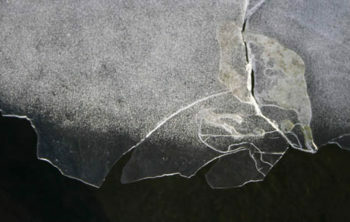 Modern technology is used with water-jet cutting, by which the basic silhouette of each figure is cut from optical glass. 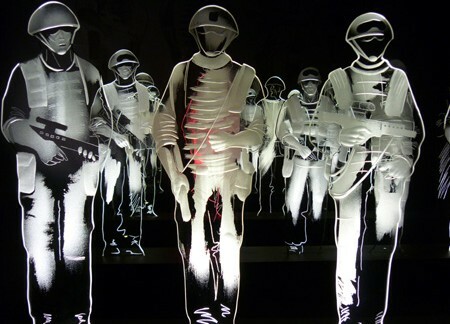 The figures are lit with LEDs, invisibly contained in the base, which trap and transmit the light into each soldier. The backdrop shows the shadows of five of the soldiers, handpainted on textile. The base is scattered with silk poppy petals. ‘Unknown’ was displayed in the Scottish Parliament for a month in 2014, before going on display in various venues in Scotland; touring a number of Art Galleries, Museums and National Trust properties* in association with Poppy Scotland. It was also exhibited in St Mary’s Cathedral, Edinburgh for Remembrance Week last year. The reaction of the audience has been extremely moving and in St Mary’s, the visitors placed their own poppies on the plinth. Visit Alison’s website to see more images here. St Giles' Cathedral, High St, Edinburgh EH1 1RE From 9am Mon-Sat, 1pm on Sunday, till 5pm each day. From November 1, 2018 to November 15, 2018.